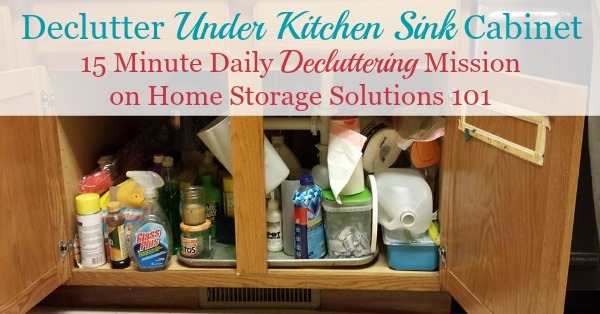 Today's mission is to declutter under your kitchen sink cabinet. 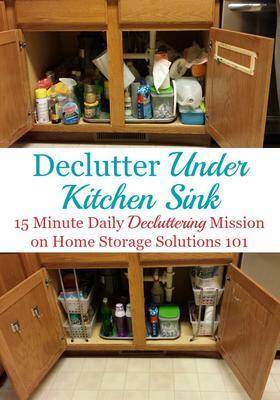 This mission is designed to be done while working on the Kitchen Drawer & Cabinet Organization Challenge here on the site. Since the space under your kitchen sink is small and contained the best way to approach this mission is to empty everything out of there, and then make each item "earn" its spot back under the sink. That means getting rid of trash and items you never use, putting items away that do not belong there, and then finally, removing excess and duplicates until what you've got in the space can easily fit. While I don't personally believe this area has to be empty, the fact that there are pipes and such items under here means you've got to be able to remove stuff from it quickly in case a plumbing emergency happens. That means it is important not to have it packed to the gills, but instead to have only what is necessary there. 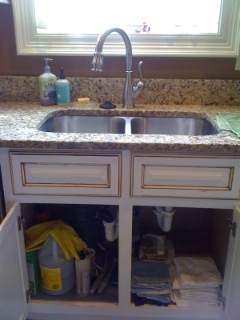 You can store whatever you want or need in this lower cabinet space, but often people keep cleaning supplies there. If you decide as part of this mission that you will declutter some of these cleaners, make sure to read this article about how to properly dispose of cleaning products to make sure you're doing it safely for your home, your health, and for the environment. 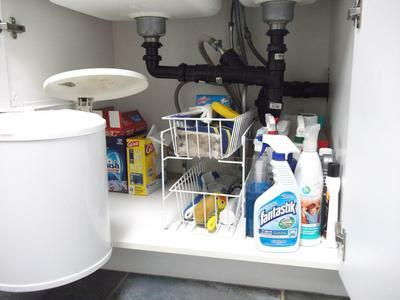 Further, after you declutter you'll need to add all the stuff back under your sink cabinet yet again. There are lots of ways you can place these items in there in an organized fashion. 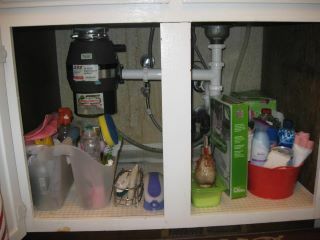 To get ideas check out my article on how to organize under your kitchen sink here. Now, below I've shared lots of photos from readers who've taken on this mission, showing their great results from decluttering, to get you inspired and give you ideas for what you can do under your own kitchen sink. And make sure, if you haven't already, to also do the mission to declutter your kitchen sink area itself, that is above this cabinet! I also worked on clearing my kitchen countertops this week, and even got a head start on some of the things coming up in the kitchen in the weeks ahead. Thanks so much for these challenges! I look forward to working on more! Thanks so much for sharing your picture Lisa. It looks great under there! Here's some more photos from a reader, Camisha, who also did this Declutter 365 mission and shared her before and after photos. She said, "I finally got to under the sink. It really was easy- guess I don't have attachments or feelings to most items there - it didn't take much thought, and boy am I going to love the order!" Jennifer at Life of Reilly showed before and after of this cabinet after she decluttered it. She said: Well, first of all, it's a good thing the cabinets were organized this week. When I started taking everything out from under the sink, I noticed a pool of water at the bottom. I called my husband over to inspect the problem, and it turns out that the garbage disposal had a crack in it. So he replaced it that day, and I was able to finish organizing. As you can see in the picture above, I already have my saran wraps stored on the door, and this system works for me, so they're staying there. I had some freezer storage bags down here, so I moved them to the upper cabinet with the rest of the storage bags. There were a few cleaning supplies that I didn't use in the kitchen, so they moved out. All that's left down here now are garbage bags and kitchen cleaning supplies. Bec from 2012 - The Year of Challenges, shared her before and after pics of this area of her home. Just straightening everything up and decluttering a bit can make a big difference! Karen shared her before and after pictures on the Home Storage Solutions 101 Facebook page. I like how she has some cleaning caddies in there holding her supplies. That way she can pull things out when she needs them, anywhere in the house, easily carry them around and then put them back. In addition, she can easily get to get garbage disposal or sink plumbing if needed with the way she's organized in there. That is important since you never know when you may need to do a repair or deal with an issue with this appliance. 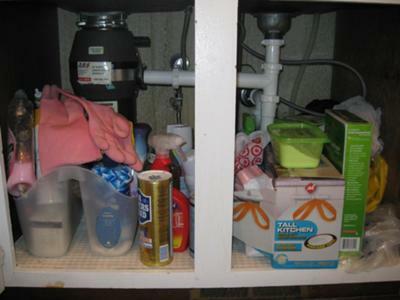 Are You Ready A Clutter Free Under Kitchen Sink Cabinet? 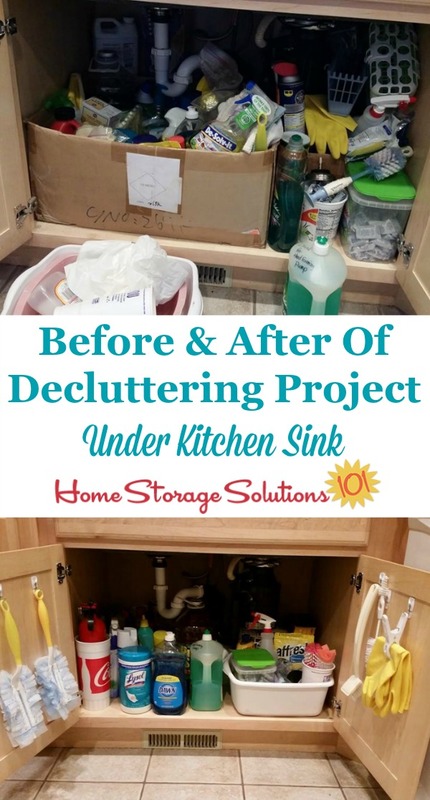 I hope these photos have gotten you inspired and ready to tackle your own kitchen under sink cabinet, and to remove the clutter. Once you've gotten rid of the clutter your job is almost over, but not quite. You'll still need to organize what you've got left. But don't worry, I've got real life ideas and practical advice for that task too. 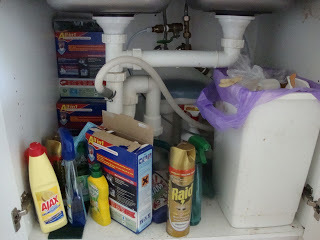 You can see lots of photos, similar to the one above from a reader, Debbie, who organized under her kitchen sink here, in this companion article on the site. If you're now ready to tackle lots of decluttering projects in your kitchen and home, make sure you've joined the Declutter 365 missions here on the site. 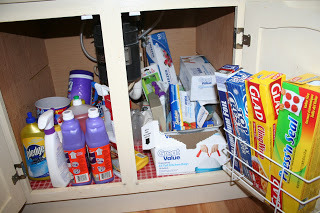 Comments for Are You Ready A Clutter Free Under Kitchen Sink Cabinet? I love the use of the removable hooks! I may have missed some of the after pictures. I am wondering where everyone puts their kitchen fire extinguisher? I keep mine under the sink which is not too far from the stove. Yes, you can definitely keep your fire extinguisher under your sink, as long as it is toward the front and it doesn't get pushed back by clutter and other stuff over time. Here's an entire article here on the site about fire extinguisher placement with ideas for where to put them in your kitchen and throughout your house. Glad to hear about other people putting the fire extinguisher there. I will put mine under the kitchen sink now. I also find a small milk crate (depending on how much space you have) works well to hold the cleaners and dishwasher detergent. I have an older house so I have a fairly generous space under my sink. I made a small investment and installed sliding baskets under mine several years ago. It has been a life saver! Nothing gets lost in the back because I can pull out the basket and see everything at anytime! Makes maintaining the organization much easier also. Any suggestion on how to better use that deep dark hole in the corner? I slide cookie sheets or long platters and anything that is wasted for size. I have also put in large salad bowls and a dehydrater. If you have young children a child proof lock needs to be to be kept on door or store cleaning supplies in another location. To help keep bottles organized I put them in a storage container or a shallow box. That way the whole box can be taken out if an emergency arises. I do have duplicates of a sort. I use different cleaners for different items, i.e., a special cleanser for my pots and pans, and one for the sink. Great idea for the swiffer duster to be put on a command hook right where you need it. I never thought of that! So I just hung one (along with a can of furniture polish) on the interior of my entertainment center, one in my office desk, one in my dresser and one in the kitchen. That will make keeping up with dusting so much easier. Thanks for the idea. Camisha, I love what you did with the rubber gloves. Hanging them on the inside of the door is a perfect solution for me. I have always hung them on the pipes. Seems yucky to me. I suspect the gloves will dry more quickly and thoroughly by hanging them on the door. Thanks so much. I decluttered under our sink today and was surprised at how many containers of bug spray, fertilizer, etc., had accumulated in there. Since we don't have small children anymore I guess I got used to sticking stuff under there instead of carrying it to the basement. I'm glad to have the free space, and I feel just a little safer with those chemicals away from the kitchen. Looks great! Like a breeze came through and refreshed the area. Really like that you got rid of cardboard box. I no longer use them as they seem unsanitary. I live in Africa and it was drummed into us to NEVER leave any cleaning products under our kitchen sinks. As our kids play often in our kitchens they can easily get poisoned by the chemicals in cleaning products kept under sinks. I cannot understand how you Americans can keep harmful chemicals within such easy reach of children. In any African home you will find cleaning chemicals above the sink, and pots and pans kept under the sink. The world certainly has it differences as well as its similarities.